Coming in just under the 5-year mark, I’ve finished my T-shirt quilt! 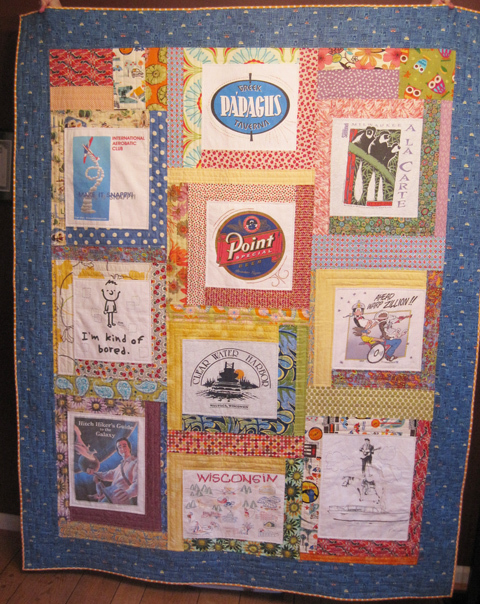 The quilt is titled “A Few of My Favorite Things” because I’ve used my favorite old T-shirts that I could part with and some of my favorite fabrics (from about 5 years ago). It’s been a long time in the making, and I can’t want to snuggle up under it. Previously, I had blogged about making the quilt top (with some embroidery added to fill in some of the white space on the T-shirts) and finding the right border fabric (you can read that post here). The latest hold-up for this quilt was the quilting. When I finally worked up the gumption to dive in to the quilting, I did a few blocks and then realized I didn’t like it. 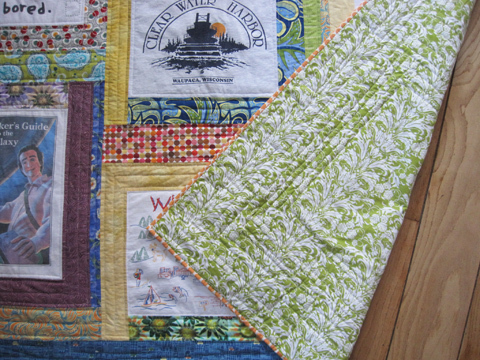 So then it sat for a while (months) longer while I worked up the gumption to take out that quilting and start again. The quilting I ended up with is just straight lines in the printed fabrics and tack-down stitches on the T-shirts. Nothing too fancy or dense, but it all takes time. With the quilting finally done, I was ready to get this project off my list. But I still had the binding to do. I auditioned a few solid and solid-reading fabrics, but Greg and I both thought they would be a visual let-down given the rest of the quilt. So I went with this orange dot fabric. It turned out brighter than I thought it would, and it’s possibly a bit distracting. But the fabric is definitely one of my favorite ones, so I think it works. The back is one fabric, just a pretty print I got on sale at the Herrschner’s warehouse sale last year. I love this quilt for so many reasons. First, I’m proud that I made the whole thing myself. I learned a lot while making it, especially about working with knits. And the shirts and the fabrics bring back so many memories. A few of the shirts I received as gifts from my friend, Lynn. Several I associate with my sister, Carrie. One I received from my sister, Brenda. Two I bought on work trips for my first job. And then there’s the fabric, many of which I bought on shopping trips with my mom. So, so many wonderful memories. All wrapped up in a quilt that I can’t wait to wrap up in. A few weeks ago, I blogged about a birdie pincushion I made for a swap that was to take place at QuiltCon. Well QuiltCon has come and gone now, and all the swapped pincushions have found a home. Earlier this week I received an e-mail from Elizabeth from the Oklahoma City Modern Quilt Guild that my birdie is now in her sewing room. You can check out Elizabeths’ blog here. 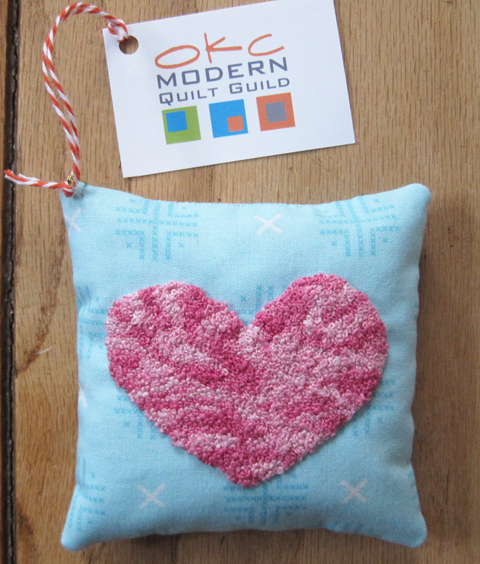 Then at the Wednesday Cincinnati Modern Quilt Guild meeting, a new pincushion came to live with me. It was made by Amanda, also of the OKCMQG. The heart on the front of the pincushion had several of us at the meeting stumped, and we finally decided it was probably needle punched. Since the cute tag attached to the pincushion listed Amanda’s blog, I went to check it out. 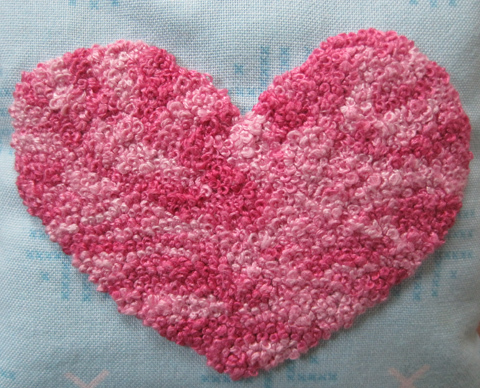 And there I learned that the heart is made up of French knots. Hundreds and hundreds of French knots. Can you believe it?! I e-mailed Amanda to let her know how much I loved the pincushion and the variegated embroidery floss she used—and how impressed I am by it. She said she made the knots while watching Downton Abbey—perfect!. To read about this pincushion and to check out Amanda’s blog, click here. Thanks to the organizers of the QuiltCon pincushion swap and to Teresa, who organized it for the CMQG. I hope we can do something like this again! 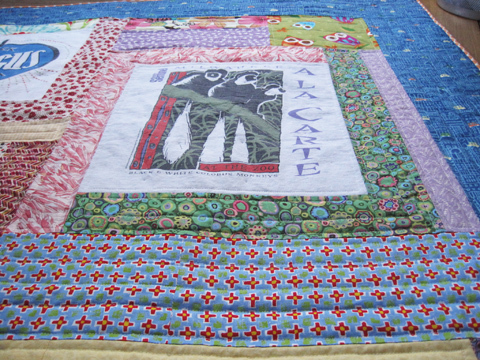 Craft Hope, the group for which I made the aprons for Haiti last year, has a new project up! 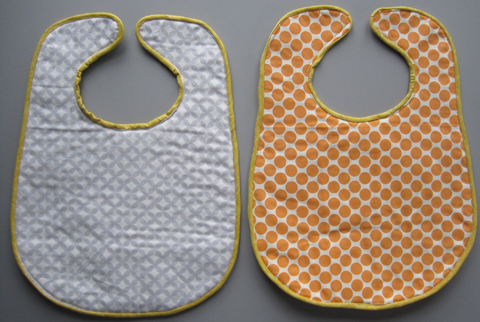 Titled Hope for China, this project is asking crafters of all sorts to make baby bibs for orphaned children in China. One of the members of the Cincinnati Modern Quilt Guild has adopted two daughters from China, and she is encouraging everyone in the guild to participate. 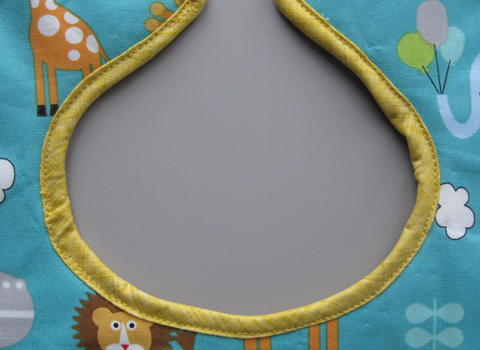 So last weekend, I started sewing baby bibs! For projects like this, I have found it very useful to have at least one book of baby projects in my library. Again I pulled out my copy of Amy Butler’s Little Stitches for Little Ones, this time to find a bib pattern. The book contains one bib pattern with two variations; I chose the variation that allowed me to use some animal fabric from my stash that I had gotten for my next children’s charity project (whatever that was going to be). This particular pattern has a bound edge, which requires attaching binding on both concave and convex curves. This would be my challenge. I decided to make two bibs. 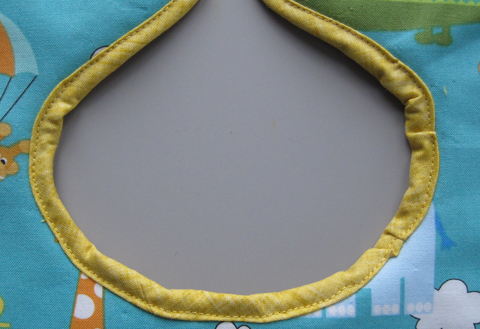 After I had the pieces for both bibs cut out and layered, it came time to attach the binding. I cut the binding on the bias, as directed, and then I pinned like crazy. 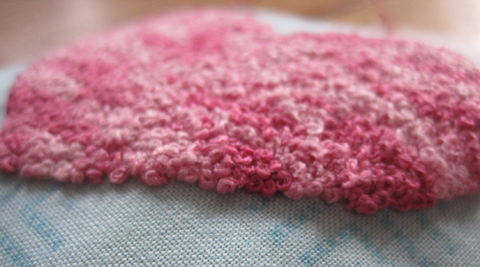 On the first bib, I didn’t trust the give of the bias-cut binding enough, so I left it way too loose, which resulted in lots of puckers around the neck. On the second bib, I stretched the binding a bit more as I pinned, and the result was fewer puckers (although I still have some work to do to eliminate the puckers all together). While the fronts of each bib are the same, I switched it up a bit on the back. The white and gray fabric is actually a flannel, making that one a bit more cozy. Now I just need to add the Velcro closure to each to finish them off. If you’re interested in participating in the Craft Hope project, there’s still time. 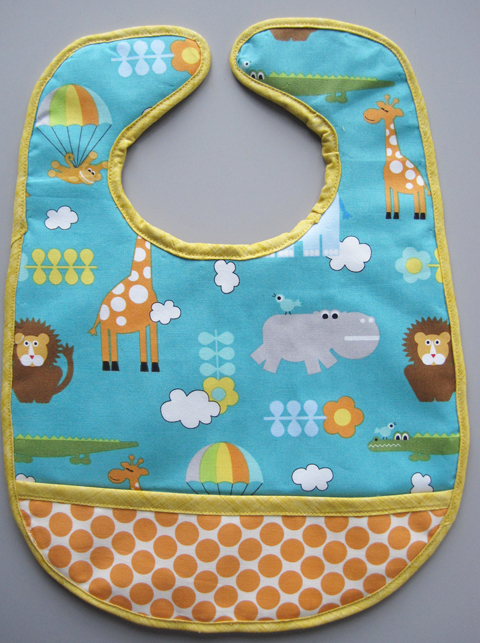 The bibs are due on April 1, in time for an adopting mother to bring them to China with her. 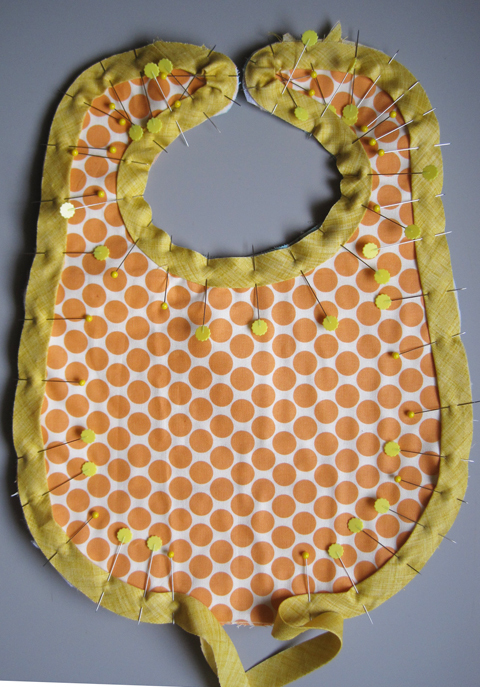 The bibs may be constructed in any way you like; they’re collecting knit, crocheted, sewn and even no-sew aprons. Check out the Craft Hope Facebook page for the details and links to tutorials.